Yannick Noah | Make Time For Sports. “But what do I care if he says hello to me or not?" Yannick Noah is not regretful—one bit—for stirring up a hornet’s nest with his comments in French daily, Le Monde, accusing Spanish players of systemic doping. Noah said that all players, not just Spanish, should have access to this “magic potion” that has Spaniards out-performing their French counterparts. "I am a bit frustrated that there are two weights and two measures in terms of doping, whether it’s Spain or another country.Of course all Spanish athletes aren’t doped … (But) are (the French) worse than the others? I don’t think so." Noah’s remarks have been met with derision and wide-spread condemnation. Rafael Nadal called for a media gag on Noah. "I went through the same thing 30 years ago, when I was 20. I spoke about doping and drugs and everyone had a go at me.I couldn’t respond to everyone. To Toni Nadal, Rafael’s uncle, who’s told his nephew never to say hello to me again. But what do I care if he says hello to me or not?" Noah pointed out existing cases of Spanish doping including high-profile names such as cyclist Alberto Contador and steeplechase champion Marta Dominguez. "The cyclist who ate some meat that helped him pedal faster and who was cleared by his federation, the case of (Dominguez) stopped by the police and then cleared.My question is the following: Is this not all orchestrated? In the Puerto case, I have the feeling that the affair has been smothered, that names have been hidden." I am against all forms of doping, but I’m hypersensitive when it comes to injustice. There are too many cheats winning these days. In Spain and elsewhere.At which point is an athlete considered to have doped? When he takes a product that makes him run faster, makes him stronger, helps him recover more quickly? Or when he tests positive? The answer to the question is not the same, depending on the country. There are side effects which you never read about on the front pages of the newspapers.We know there have been problems in the past with Italian footballers who are now seriously ill.
Read Yannick Noah’s full interview to Le Monde here. “When one kid says something it’s not painful for us." 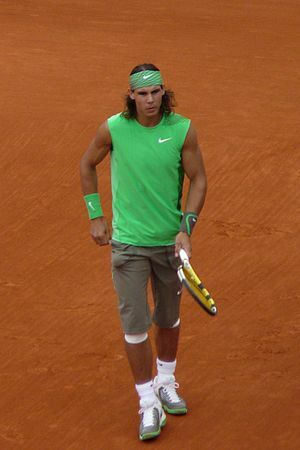 Rafael Nadal kids not in his response to Yannick Noah’s allegations of systemic doping by Spain’s elite athletes. “Today if you don’t have the magic potion, it’s hard to win. How can a nation dominate sport virtually overnight like this?" When I still milled around on the courts with my racket, we weren’t ridiculous, far from it, against our Spanish friends. It was the same on the soccer fields, the basketball halls or on the roads of the Tour de France. Today they are running faster than us, are much more stronger and only leave us the bread crumbs. We look like dwarves. Did we miss something? Did they discover some avant-garde techniques or training facilities that nobody before them had imagined? Nadal reacted angrily to the Frenchman’s allegations. "What he said is completely stupid. This guy does not deserve to write in newspapers anymore." He knows better than anybody that to say that today is a totally stupid thing because you know how many anti-doping controls we have during the season, year by year. So in my opinion, the article that he wrote was from a kid and when one kid says something it’s not painful for us. The French tennis federation were equally trenchant in their criticism. The French Tennis Federation wishes to express its disagreement with Yannick Noah’s comments made in Le Monde newspaper. Against the plague of doping in sport, baseless accusations and provocative comments are inappropriate, and the worst attitude would be to give up. Former French tennis star, Yannick Noah, set the cat among the pigeons with his remarks in the French daily, Le Monde, accusing the Spanish players of doping. Noah is the last French male to win at Roland Garros. When I still milled around on the courts with my racket, we weren’t ridiculous, far from it, against our Spanish friends. Same on the soccer fields, the basketballs halls or on the roads of the Tour de France. Today they are running faster than us, are much more stronger and only leave us the bread crumbs. Compared to us, it’s simple, we look like dwarves. Did we miss something? The Spaniards were quick to react. Your son [Joakim Noah of the Chicago Bulls] plays in the NBA, where there are no doping controls. This is not the best person to talk, I think it’s total ignorance. For a person who has played tennis and knows how the sport works to say that is outrageous with reason or thinking. It seems out of place. Spain is now the leading power of sport and statements like that are not good for him and not for sport in general … When people want fame, the only way to have it’s messing with a person or an entity as large as Spain in sport. In basketball, soccer, tennis, Formula One, athletics—in all sports Spain is at the forefront. The French minister for sports, David Douillet, distanced himself from Noah’s remarks. “I am living proof that one can win without doping." Douillet is a double Olympic judo champion, winning gold at the 1996 and 2000 editions. He is also a four-time world champion. French doubles specialist, Michael Llodra, apologised to Rafael and Toni Nadal for Noah’s remarks.